J and I stumbled upon this place a couple of winters ago after shopping on the Danforth. We were starved and unimpressed with the treatment we’d received at well-known eatery down the street so we headed eastward in search of beer- and food-age. Seeing the quaint sign hanging above the pub entitled The Auld Spot, we knew we had to check it out. We grabbed one of the tables toward the back of the roughly 50-seater neighbourhood pub and perused the menu. Our very friendly and knowledgeable waitress advised us that if we were looking for something a little different bevvie-wise, the St. Ambroise Apricot Wheat Ale was not to be missed. J went for it: I’m not really big on apricots. The pints arrived and we ordered a side of onion rings as we were only looking for a snack. J insisted I try the St. Ambroise so I hesitantly took a sip. Oh. Muh. Gah: where had this been all my life?! We waited for our onion rings and watched the place fill up with people from the surrounding area, clearly regulars, and other weary shoppers. Platters and platters of oysters came flying out of the kitchen and J and I looked at each other with surprise. What had we stumbled upon here? When our rings arrived, they were piping hot, crispy and, importantly, the onion didn’t slide out in one bite. We devoured the basket in record time. 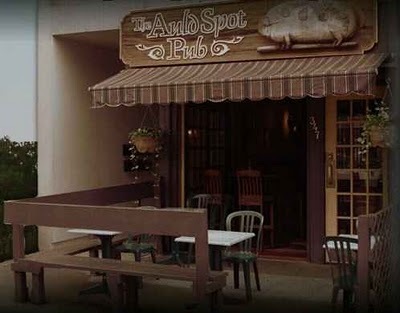 The Auld Spot is just one of those great pubs everyone wants in their ‘hood. It’s friendly, the food is reasonably priced and of good quality and it doesn’t look like every other pub you’ve been to in your life. You’ve got to check it out! 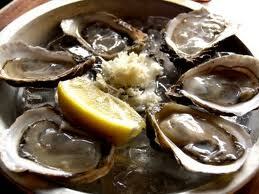 Oh, and on my birthday this year, we popped in for a snack and this time tried the oysters. The diners on our first visit were on to something: the oysters were briny and slippery and unquestionably fresh. Those other people on our first visit knew what they were doing! And yes, the Mac and Cheese has GRUYERE in it. How can it not be delicious. All they need to do now is make a gluten-free version of it, so I can enjoy it again! The meat-cheese butter dip thing I had @ Robbie Burns night was made of artery-clogging delicious. 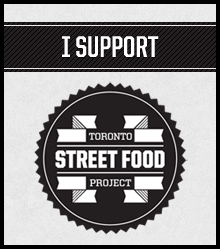 I’d tell you it’s official name so the internet masses would know, but the website is under maintenance right now.